You don’t have to buy a house | Military Money - Should you buy a house? Buying a House is Not Always A Wise Investment. Anonymous: “If I paid $4,500 a month for my mortgage…and will owe $20,000 when I sell the house…how did I win here? This is not a fun conversation to have. Unfortunately, it is a conversation I’m all too familiar with. Buying a house has long been a symbol of adulthood. Families dream about their house with a white picket fence and save aggressively for a down payment. The biggest purchase many families will ever make is when they buy a house…but does that make it a wise one? There are many occasions where it is a great investment to buy a house. There are also many times it isn’t. For this article, I’m going to focus on several of the downsides to owning your primary residence. This isn’t because I’m against homeownership, but rather because I want you to be intimately familiar with the reality. I want to ensure you understand some of these expenses, and how to avoid disaster. When homeowners buy a primary residence they look at things like: school district, neighborhood, community, crime, status, age, etc. These are not bad things, but these high-end neighborhoods require you to pay to play. This makes it very easy to get emotionally attached and drastically overpay for a property. That is great if you intend for it to be your “forever home” but if not, move on. In 2011, the average length of homeownership was only 9 years. With most homes being on a 30 year mortgage, or at least 15 years, this means the average American doesn’t pay off their home before moving. If that is the case, do you really want to be stuck overpaying for a property that may not appreciate in value before you sell? This is why I always recommend buying an investment, not just a home. The most common question asked throughout the preapproval process is “how much can I afford to buy.” Potential homeowners look at how much they can afford to spend on their monthly mortgage payment. That is great, but just because you CAN afford it, doesn’t mean you SHOULD buy it. I think the most important criteria when deciding on a primary residence is if it will cash flow when you move it. That is, if you can’t sell it, will you be able to rent it for more that your current mortgage. If not, I would suggest moving on. The reason for this is that appreciation is great, but not guaranteed. If you need to move, and your house drops in value, you better hope it will cash flow. If your mortgage payment is $1000/month, but the home will only rent for $800/month, are you comfortable losing $200 a month (plus other expenses like maintenance, vacancies, etc.) until you can “break even” selling your property? You shouldn’t be! However, if your mortgage payment is $750/month, and your property rents for $1,000/month you should be fine renting it until the market appreciates. Hell, you might even get addicted to the “real estate game” after seeing the power of positive cash flow firsthand! It astounds me how many people fail to plan for maintenance costs in their homeownership expenses. New air filters, water filters, chimney-cleaning, clogged toilets, leaky sinks, etc. Maintenance is a regularly occurring expense, and depending on the age of your home this can quickly add to your monthly expenses. Don’t forget to budget for maintenance expenses every month when purchasing a property, or factoring the cost(s) of holding onto it. One of the simplest ways to budget for maintenance is to look at the annual expenses over the last 12-24 months. Then divide that dollar amount by the number of months and you will have an average monthly maintenance expense. At this point, the smart thing to do is set that amount aside every month in order to be prepared for these expenses. Capital expenditures (or Cap-Ex as it is commonly referred) are the large maintenance items associated with real estate. Examples of Cap-Ex are items like the roof, dishwasher, washer/dryer, water heater, furnaces, etc. These are the larger items with a life expectancy that allows you to budget for when they will need to be replaced. This is probably the most overlooked expense in real estate. It is not easy to think about budgeting for a $15,000 roof when it may still have 20 years of life left in it…but it is important. Imagine if the water heater, air-conditioning, and roof all needed to be replaced in year five of ownership. That would be a brutal year. This is a possibility, but you can prepare for it by estimating when these items will need to be replaced, and how much it will cost. If you can plan to set money aside monthly for each potential cap-ex expense it will greatly enhance your ability to prevent catastrophe. If you aren’t disciplined enough to budget for these expenses a simpler method is to save 7-10% of the income you receive on the property. While not as precise, this is much better than what most homeowners do. Appreciation RUINS homeowners. Appreciation is wonderful, but justifying an expensive home purchase because of how much it will be worth in two years is gambling. Nobody can predict the market with 100 percent accuracy. The gentleman quoted at the beginning of this article bought a home in Hawaii. He bought this home in an area where the market had shown extreme growth and showed no signs of slowing down. Yet almost three years later is has barely appreciated in value, and after sales expenses, he will be forced to pay $15,000-$20,000 out of pocket! This terrible situation is all too common for homeowners. That is why I tell everyone it is okay to rent. I think some real estate investors feel like renting a home is admitting defeat. There is a stigma that you must own your home, must house-hack, must make it work. This mentality is foolish, and a surefire way to fall into the trap of justifying a bad investment. Grant Cardone is a big-time real estate investor and syndicator. He owns well over 500 million dollars’ worth of apartment complexes and growing rapidly. Yet Grant is a huge advocate of the idea that you should always rent your residence. While I disagree that you should always rent your residence. I agree that it can be a wise decision. I lived in Marine Corps base housing for the last three years, and while the idea of missing out on equity was painful, I know it was the right decision in the end. The most important variable is the market you currently live in. 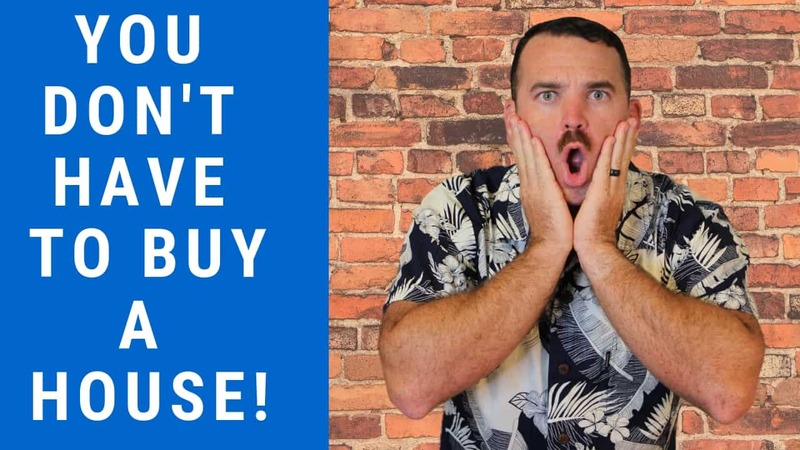 If you live in an expensive market, where it is impossible to cash-flow, I would suggest renting unless you’re 100% certain the market is at a low point, and will absolutely appreciate substantially. Don’t let your pride get in the way of your financial intelligence. There is absolutely nothing wrong with renting your current residence. There are markets and situations where buying a home or house-hack is a great idea, and there are markets where it isn’t. Understanding what market you’re in is key, and as always you need to keep your emotions out of the decision. I am currently looking to buy a motorhome/RV to live in while I’m stationed at Camp Pendleton, CA. This sounds like a fun experience and it will make some great stories. I should also be able to live for under $1200/month in a market where mortgages are easily double that. If this plan doesn’t work out we will find a small apartment to rent for no more than $2000/month and still be able to save a substantial amount of money each month. Look at these two stories. The homeowner losing thousands of dollars because they bought unwisely, vs the renter keeping over a thousand dollars a month in his pocket to reinvest. When you put it that way, the homeowner sounds like the silly one. Remember to always know your market. There are great times to buy, and great times to rent…make sure you understand the difference, and act accordingly! My buddy Rich Carey and I share this viewpoint, check out his article about this here!